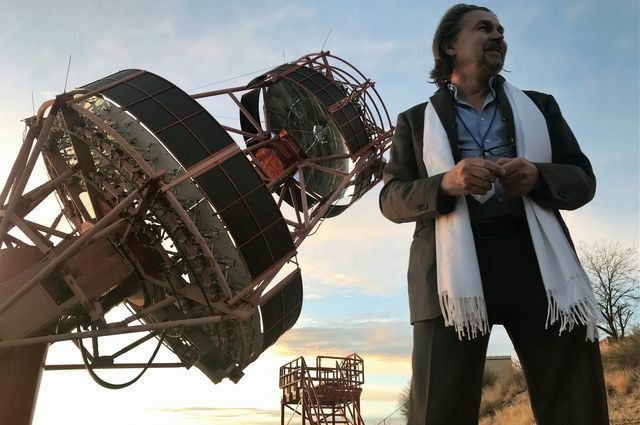 Vladimir Vassiliev and the prototype Schwarzschild-Couder Telescope in Southern Arizona. The worldwide Cherenkov Telescope Array project aims to construct the world’s largest and most sensitive ground-based, gamma-ray observatory, with 118 telescopes in the Northern and Southern hemispheres. 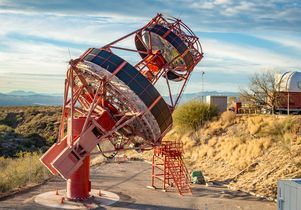 The array’s workhorse will be a medium-sized telescope, whose prototype Schwarzschild-Couder Telescope, was extensively developed in the United States, with UCLA originating and leading the effort. 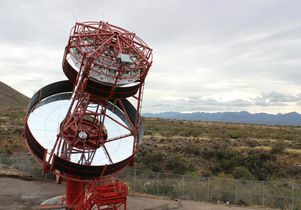 The prototype, known as a pSCT, was unveiled Jan. 17 at the Fred Lawrence Whipple Observatory in southern Arizona, near Tucson. When up and running, the array of Cherenkov telescopes will work as an integrated system of telescopes in Paranal, Chile and La Palma, Spain. Using telescopes of three sizes, researchers using the array will be able to study the gamma rays in the sky with the sensitivity 10 times better than currently achieved. This will help to address some of the most important and perplexing questions in very-high-energy astrophysics. The optical system for a Schwarzschild-Couder Telescope was first proposed by German physicist and astronomer Karl Schwarzschild in 1905, but became possible to construct in 2006, with advances in research and technology, said Vladimir Vassiliev, UCLA professor of physics and astronomy. 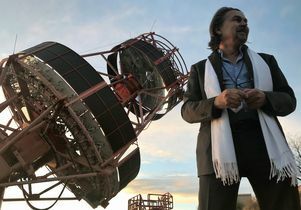 Since 2012 Vassiliev has served as principal investigator on this National Science Foundation-funded project to build a new world-class telescope for ground-based, gamma-ray astronomy. Scientists hope the Cherenkov Telescope Array will provide insights into extreme environments in the universe, such as very-high-energy jets emanating from the black holes in the centers of active galaxies, supernovae explosions and possibly self-annihilation of weakly interacting dark matter in the Milky Way galaxy center and its halo. Since the project was launched more than a decade ago, UCLA scientists have contributed prominently to the development of both the scientific rationale behind creating the array of Cherenkov telescopes and the observatory instrumentation. The Schwarzschild-Couder Telescope is designed to improve the array’s ability to study gamma-ray sources, more efficiently conduct sky surveys to find them and rapidly respond with follow-up observations initiated by “multi-messenger observatories” such as neutrino and gravitational wave detectors, Vassiliev said. Multi-messenger means scientists use all three stable neutral elementary particles — photons, gravitons and neutrinos — to learn about the universe. Vassiliev is hopeful Schwarzschild-Couder Telescopes will become a part of at least one of the two arrays in Chile or Spain. “Our primary goal with the prototype SCT project is to demonstrate the performance of this original and innovative instrument in the next two to three years, and, if theoretical expectations are largely validated, we plan to submit a proposal to NSF to construct 10 telescopes of this type for the CTA observatory,” Vassiliev said. The Schwarzschild-Couder’s complex dual-mirror optical system improves on the single-mirror designs traditionally used in gamma-ray telescopes by dramatically increasing the quality of images over a large, 8-degree-diameter region of the sky, and by enabling the use of compact, highly efficient photo-sensors in the telescope camera, Vassiliev said. The 9.7-meter-diameter primary mirror and 5.4-meter-diameter secondary mirror consist of 48 and 24 mirror panels, respectively. Integration and calibration of mirror panels took place at UCLA prior to installation. “The pSCT project would not have happened without cost sharing resources provided by the Dean of Physical Sciences Miguel Garcia-Garibay; former Dean Joseph Rudnick; Roberto Peccei, UCLA’s former vice chancellor for research; the physics and astronomy department, and critical support from UC-wide Institute for Nuclear/Particle Astrophysics and Cosmology and, in particular, its director, Bernard Sadoulet,” Vassiliev said. The Cherenkov Telescope Array project is the highest priority effort in particle astrophysics in many countries, Vassiliev said. More than 1,400 scientists and engineers from 31 countries are participating in the scientific and technical development of CTA, which will be the first ground-based gamma-ray astronomy observatory open to the worldwide astronomical and particle physics communities. Operation of the complete CTA is planned to begin in 2026, while observations with partially deployed imaging atmospheric telescope arrays may start as early as 2024. Vladimir Vassiliev with the prototype Schwarzschild-Couder Telescope.